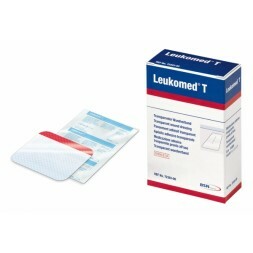 Leukomed T is a sterile, breathable, water, bacteria and virus proof transparent film dressing. It is designed for the fixation of primary dressings and protection of non-exuding wound sites. The transparent film dressing allows for the wound to be inspected with having to remove the dressing. The unique red tab technology makes the dressing easy to apply and reduces the risk of infection. The low profile film makes the dressing hardly noticeable on the skin neither visibly nor by touch allowing high wearing comfort for the patient. The transparency of the film allows for clear visibility of the wound so the patient and the clinician can assess the therapeutic progress without having to remove the dressing. As the dressing is water, bacteria and virus proof it reduces the risk of infection. The waterproof barrier allows the patient to continue on with activities of daily living without the need of dressing changes. Leukomed T is a skin like film for cover and protection of post-operative and superficial traumatic wounds. This sterile dressing works as a bacterial and viral barrier, is waterproof and effectively helps to prevent infection.